Safe-T-Sport Neoprene Shoulder Support, manufactured by FLA Orthopedics, is specifically designed to stabilize, support, and protect an individual's shoulder, while simultaneously offering flexibility of the joint. Featuring neoprene material, this shoulder support delivers a comfortable and therapeutic compression. In addition to compressive properties, the neoprene material naturally offers a four-way stretch for a proper and comfortable fit. The neoprene, additionally, retains your body's natural heat to soothe and warm the localized area, including the joint and surrounding muscles. To add more heat, this support brace offers a built-in pocket that can hold a re-usable hot pack, sold separately. However, if you prefer coldness, you could insert a cold pack in its stead. Offering adjustable chest and arm closures, you can easily obtain the perfect custom fit. You can comfortably and easily wear this under clothing, too. To determine the correct size, please scroll to the bottom and glance over the table. Measure the circumference around the chest and compare the results to the table. 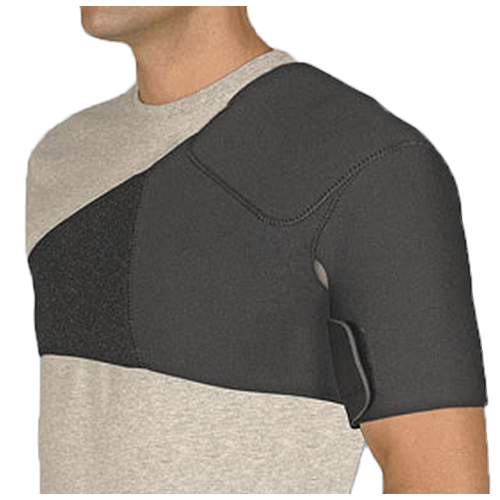 Enhance your shoulder recovery by ordering the Safe-T-Sport Neoprene Shoulder Support today! However, if this rehabilitative apparatus does not meet your needs, check out these shoulder supports, such as the shoulder sling and shoulder immobilizer, here. Adjustable chest and arm closure. Comfortably rests beneath articles of clothing. Retains heat to soothe injured area. Stretch material that ensures a proper, snug fit. Zippered pocket that contains a hot/cold pack. Product Numbers: 16-500SMBLK, 16-500MDBLK, and 16-500LGBLK. Sizes: SM, MD, and LG. Application: To alleviate pain and discomfort associated with shoulder injuries. I tore a ligament in my left upper arm. When I use an ace bandage around the upper arm I get some relief. Would this help for that? We can't make any recommendations on products because we don't employ any medical professionals. It's best to either seek the opinion of a medical professional or contact the manufacturer directly.